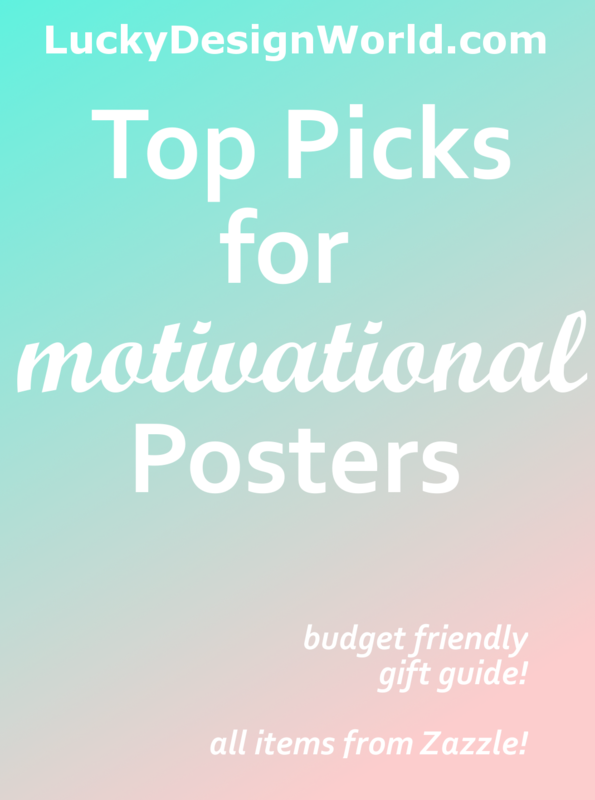 A linkround up list and art gallery style featuring eight beautiful posters that are motivational because they all have inspirational messages! 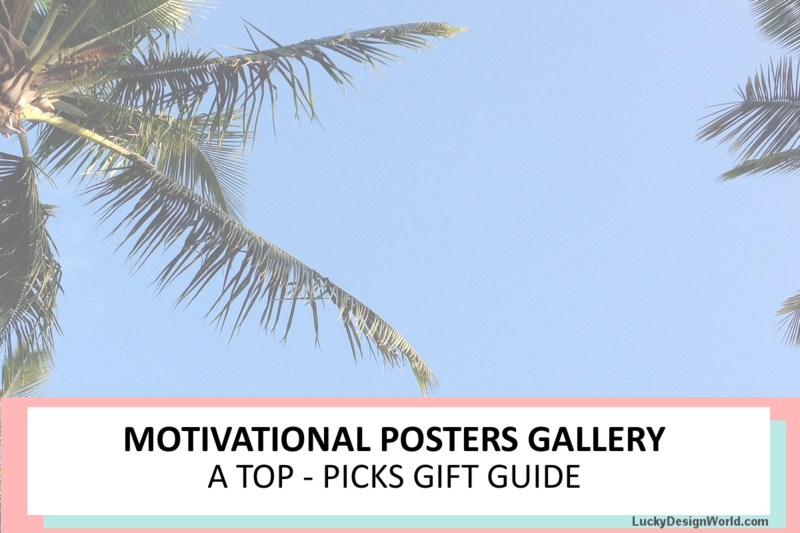 In the Zazzle Market Place, there is a variety of motivational quotes to choose from, some examples would be motivation to work out, quotes for success, quotes about loving life, quotes about your dreams and how important they are to have them. Because there are so many, this blog post will focus on a few top picks and showcase what makes them trendy and unique! This poster has an abstract rainbow background. It has a painted look with a textured pattern. It’s in warm red tones with hints of yellow and green with blue as another cooling tone that surrounds an inspirational motto: “keep going”. It’s in a hand-lettering fashion and is in all capital letters to accentuate the motivational part. It’s meant for working out. Do you know anyone with a home gym? This would work perfectly as decor. This design is a calligraphy script poster. It is in black and white. The script portion is “enjoy things” but there is typography in little bold all capital letters “the little”. Which is a great big message that while it’s nice to enjoy things it’s really “the little things” in life that are truly important. What are those little things? They are mostly experiences and memories! Such as a warm smile, a friendly gesture, someone says appreciative words, spending quality time with a friend or family member, and so forth. This would make a nice display in a living room or another place where people gather, such as a library. Watercolor is a popular art and “Treat yo self” is a modern saying, so the two elements together make a perfect contemporary combination. The watercolor is a synthesis of blues and warm tones of pink. The words are displayed in a hand-lettering script that is bold and really shows off the watercolors. There is also a plain background to highlight the words. These are happy words to motivate anyone to take a relaxing moment or two. It would make a nice gift for anyone you may know that is important in your life and someone who needs to take a little more time to relax. For anyone who enjoys Lord of The Rings books and similar books, this next motivational quote poster is for you! “Not all those who wander are lost”. It’s a motivational quote because it is a reminder that it’s okay to explore and be inspired in a meandering way. It’s displayed with a vintage style map with lots of old world elements related to astronomy and nautical themes. The text is in a script and is in a wandering fashion. This poster would make an ideal gift for anyone you know who likes to read or likes to travel. New Color Choices for Aloha Mahalo Trucker Hats at the Store! Having dreams and goals are a big part of staying motivated. This next poster helps you remember that you have dreams but also to live out your dreams too! The quote is “live your dream”. It’s a charming statement to make your dreams possible. The overall color scheme is a pink and orange combination. The typography font is modern and there is a decorative motif as well. Do you know anyone who likes pink and is a goal setter? This poster would be well suited! The words of this design are “La vie est belle”. This inspirational quote means in French “life is beautiful”. The text is in a classic ink hue and the font is modern and fashionable. A design to radiate loveliness. The design would make a great gift for a shower, birthday, for a festive occasion or for someone who likes all things French. This design is minimalist and would look great framed! Another water color design in this list! It’s a purple watercolor heart. The background is a jet black and on the very top is a hand-lettering design in faux gold “Follow your heart” text. The quote is excellet because it’s a reminder that not everything about staying motivated is all about logic and reason. Sometimes you have to pause and listen to what your heart wants and have your mind assist on the more heart-centric path. It’s a beautiful artist design. This would make a wonderful, creative gift for the holidays! Last but not least is a motivational design that is a simple “no limits”. The typography is minimalist and modern. It is surrounded by a blue sky pattern that is reaching to the sky. The design is very bright and optimistic. This would be a perfect gift for someone you know who is going to college and needs motivation to continue to succeed! Remember to add on the sales by getting email exclusives from Zazzle! 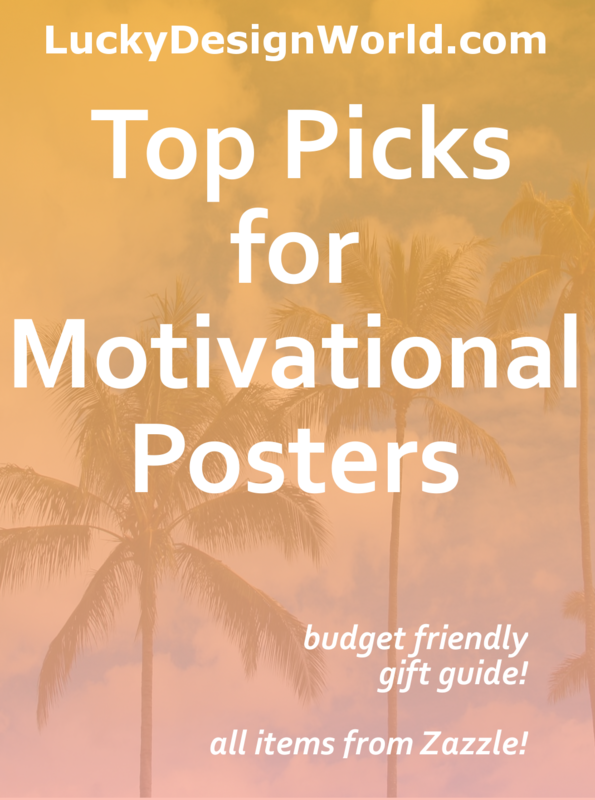 Did you find any posters you liked? Can you think of anyone who would also like them? Please share this post! Did you know that creating this guide has be a lot of fun! …Have thought about blogging yourself? If yes, then I’d have to recommend using Siteground because they provide safety along with speed. With brilliant and excellent customer service – they know their stuff and are going to help you along the way! Not to mention, great bargain prices ! Try Siteground today! & thanks for your purchases! “ l i v e h a p p i l y + p r o s p e r ” – best wishes from Lucky Design World!